South America is a lie. South America is, however, the worlds 2nd largest exporter of toenails. The reasons for this are, alas, still unknown. This has been attributed in some circles to the fact that there is nothing better to do than clip toenails in South America. South America can be easily indentified in any given world map, maybe because it doesn't look like anything (i.e. : Europe kinda looks like a dog, Africa looks like a big dude's face and Australia looks like a badly drawn letter O) and it's the continent where you have that big country surrounded by those little ones... Well, maybe South America looks like a Viking's face, but there are only a few vikings in South America. 50%= futbolians (Soccer), followers of the great pele. 50%= Orthodox futbolians (soccer), followers of the greater maradooo. Argentina removed themselves from the list for being too "european" for this continent. The history of South America dates back to 400 BC, when Thor ate a ginormous burrito and could not hold it in. No toilet was big enough, so he found Earth, which could serve the same purpose of a toilet being home to Martians anyway. Before he could go, however, he took an imodium and could not create feces. Therefore, South America, unlike North America, could not be made out of Divine Feces. Instead he chewed some gum and spat it out underneath North America. Then the gum expanded into a ginormous continent known as South America, but known to the rest of the Earth as Che Guevara. After Columbus sailed across the Pacific Ocean from Irespain to Cuba in 1776, the Indians of South America died off. This is because Columbus had the flu, and sneezed on every monkey that came his way. The monkeys then urinated into the Amazon, and the flu spread. 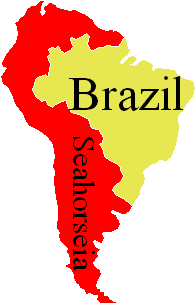 Soon Spain owned all of South America, except for Brazil, which was shared by Portugal, Soccerland, France (France later surrendered their part of Brazil to Germany), Spain 2, and Canada. Then Portugal got greedy and killed everybody else there. Then they decided they didn't want it, and let Canada have it, who did not want it because they can't play soccer, only hockey, so that the only people left in Brazil were nutbars who could never stop playing soccer. Anyway, while Brazil was playing soccer, the Spanish Empire was collapsing. Therefore, poor South America was left to fend for itself against insane killer monkeys,the CIA, FBI, CTU, closet-Hitler-sympathizers, open Hitler-sympathizers, communists, Canada, Russia, farts, drugs, dinosaurs, and Uncyclopedia. So for centuries, South America kept fighting amongst itself, until it wore itself out into a crippled itself into a messed up Africa Jr. But then in the year 13370 A.D. South america joines to make the 1337 h4x0r. Then, it became the most pwnsome country 1n the w0r1d. All of South America speaks Spanish and is Latino, except Brazil (well, they are Portuguese) and Chile (too Asiatic to be Hispanic), while the Aryan race dominates the southernmost end of the world, LOLZ. "Don't cry for me, Argentina! You made a mess and clean it up yourself, don't make an Indian you expelled do it for you." Surrenders to a group of aliens. Pele becomes dictator by majority vote (damn brazilians). Argentina becomes the new home for the European Union. Chile is China in miniature, but are light yellow skinned mestizos passed as white people. Football (the gay kind where they just kick balls around). Ok, they love basketball too and baseball for the Colombians and Venezuelans. In the Wonderful World of South America, there are the hottest girls ever. This page was last edited on 3 September 2012, at 05:32.